Scotland’s 2009 emissions fell three per cent below the 2010 target according to the report of the Committee on Climate Change (CCC). The report is the first assessment of the Scottish Government’s progress towards meeting climate change targets. It also indicates that final emissions data for 2010 is likely to show a rise in emissions, due to the cold winter weather that was experienced at the beginning and end of 2010. “The UK Committee on Climate Change Committee report is a welcome contribution to our understanding of what we need to do to achieve our climate change targets. Scotland is already almost two thirds of the way towards achieving the 42% 2020 emissions reduction target. Work started in Port Glasgow today on the world’s first sea-going roll-on, roll-off vehicle and passenger diesel electric hybrid ferries. The cutting of the first steel for the two-vessel order took place at Ferguson Shipyard. Mary Lynne Johnston, wife of Caledonian Maritime Assets Limited’s (CMAL) chairman Grenville Johnston pressed the button to start the steel cutting machine, marking the official commencement of the build. The ferries will be built to accommodate 150 passengers, 23 cars or two lorries, with a service speed of nine knots and are designed for use on many of the short crossing routes around the Clyde and Hebrides. They will be owned by CMAL, who are leading the project, and operated by the current operator of the Clyde and Hebrides Ferry Services, CalMac Ferries. Ferguson will be working alongside Glasgow-based ship design specialists Seatec and electrical specialists Tec-Source to deliver the project which is supported by a loan from the Scottish Government and additional funding of £450,000 from the European Regional Development Fund (ERDF). The ferries will use some of the most innovative new ‘green’ technology including battery banks supplying a minimum of 20 per cent of the energy consumed on board. Benefits include reduced fuel consumption and impact of CO2 emissions and other pollutants, noise reduction and lower maintenance requirements. The vessels will be powered by small diesel generator sets, feeding power to a 400 volt switchboard which will supply power to electric propulsion motors that turn the propellers. In addition, the battery banks will provide power to operate the vessel. The ferries will charge overnight while they are moored on the islands they will serve and it is hoped that in the future energy from local wind, wave or solar systems will be used to charge the batteries, making the process even more environmentally friendly. It is anticipated that the first vessel will enter service in late spring/early summer 2013, with the second following six months later. It is likely that the first ship will initially serve on the Sconser to Raasay route, subject to modifications being carried out at Sconser. 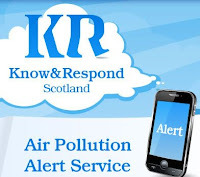 Scotland’s first air pollution mobile phone alert service, Know and Respond, was launched today in a bid to make information more accessible and improve public health. Know and Respond will allow people to sign up to receive a message – text or voicemail – when levels of any air pollutant in their area are classed as moderate, or above. Pollution levels are monitored according to the same ten level scale used in air pollution forecasting across the UK. This is the first Government driven project of its kind in the UK. “Know and Respond has been developed as another way to help the public get the information they need quickly, and at the touch of a button. “The service is open to anyone, but it will be of particular benefit to people with pre-existing respiratory and other health conditions that may be adversely affected by high pollution levels. Response messages have been developed in collaboration with colleagues within NHS Scotland, and provide advice on the action individuals need to take. The 10-level scale in air pollution forecasting was drawn up by central UK government and the government advisory body The Committee on the Medical Effects of Air Pollution. Levels 4 to 6 on the scale are classed as Moderate, 7 to 9 are High and 10 is Very High. Generally for healthy adults, moderate air pollution levels are unlikely to have any serious short term effects. However, elevated levels and/or long term exposure to air pollution may lead to more serious symptoms and conditions affecting human health in some circumstances. Today the UK Government has published the first independent assessment of the impacts the UK is facing from climate change. The CCRA presents the latest evidence on the threats and opportunities to the year 2100, with a specific report produced for Scotland. It presents evidence from individual CCRA sector reports, other studies commissioned by the project and recent research literature. It provides supporting evidence for developing the first Scottish Government Climate Change Adaptation Programme, to protect Scotland against a changing climate, which will be consulted on later this year. “Changes in climate will affect how we all live and work in Scotland for many years to come. The publication of this important assessment is a vital step towards understanding and preparing for changes in climate, and will be a valuable resource for many organisations." The UK Climate Change Act 2008 requires an assessment of the risks to the UK of the current and predicted impacts of climate change to be prepared on a five year cycle. The CCRA published today is the first assessment of climate impacts under the UK Act. While a partner in the UK Act, Scotland also has its own climate change legislation which sets ambitious world leading emissions reduction targets. Under the Climate Change (Scotland) Act 2009, Scottish Ministers are required to develop an adaptation programme to address the risks identified for Scotland in the CCRA. Banffshire and Buchan Coast MSP Stewart Stevenson has highlighted the importance of Tinnitus Awareness Week, which takes place from 6th – 12th February. “I note that the theme for this year’s campaign is raising awareness in primary care so ensuring that GPs are more aware of this debilitating condition and have a better understanding of the services available in secondary care. “It is vital that GPs have the most up-to-date information regarding tinnitus so that they can start to manage the condition in a positive way. “Tinnitus is a very common health problem, and I support the work undertaken by support groups and voluntary organisations such as Action on Hearing Loss Scotland to raise awareness and provide information and advice to people affected by tinnitus. Banffshire & Buchan Coast MSP Stewart Stevenson has called for people across the length and breadth of his constituency to play their part in shaping the forthcoming referendum on Scottish independence by taking part in the Scottish Government consultation launched today by the First Minister. A copy of the Scottish Government’s independence referendum consultation can be found at http://www.scotreferendum.com/consultation/, along with details of how to respond. “This referendum on Scotland’s future must be shaped and built in Scotland and I firmly believe that individuals and organisations across Scottish society have an essential role to play in that process. “An issue of this importance needs the input of as many people in Scotland as possible and I hope people across Banffshire & Buchan Coast will play their part and take part in the Scottish Government’s consultation. Banffshire & Buchan Coast MSP Stewart Stevenson has welcomed the confirmation that Scottish Water will freeze household water charges for 2012/13, making it the fourth year in a row where the average charge has remained at £324. This compares to planned price rises for many water companies south of the border, with hikes of up to 10% planned in some areas. “This continuing freeze in domestic water charges clearly demonstrates why it is so essential that Scottish Water remains in public hands. Scotland has some of the lowest water charges in the UK, which is more important than ever at a time when household budgets are stretched. “By having kept household charges frozen for four years, Scottish Water have clearly recognised the importance of putting money back into the pockets of ordinary people in the same way that the Scottish Government has through our continued Council Tax freeze. Compare that to the situation in the rest of the UK where some companies are planning to bring in price hikes of up to 10% this spring. Greenspace projects in the central belt can now cash in on funding thanks to an extension of the Central Scotland Green Network (CSGN) development fund. Organisations can apply for part of the £750,000 available for projects which promote healthier lifestyles, regeneration and enterprise, and help to join up the network, especially in areas suffering from deprivation and dereliction. For the first time organisations can now bid for three years of financial support, rather than one year as was the case previously. This new move will allow projects to plan for the longer-term and increase their impact on local environments. “The CSGN is Europe’s biggest greenspace project of its kind and has the ability to make a marked difference to the lives of 3.5 million living in the central belt. “It is one of our 14 National Developments and is therefore integral to our plans to promote sustainable economic growth and improve quality of life in Central Scotland. Over the past two years, the CSGN development fund has supported over 100 projects with £2.4 million. Previous projects have been very wide ranging including community growing spaces on stalled development sites in Glasgow, an employability scheme for young people in woodlands at Lesmahagow in South Lanarkshire, a plan to develop the Gartmorn Dam in Clackmannanshire into a green recreational hub and a community forest garden in Pilton. “The £750,000 of funding available will make a significant contribution to projects who are working towards radically improving the central belt. Organisations have until Friday 2nd March 2012 to submit their funding applications to Forestry Commission Scotland. For more details and the application form, please log onto www.forestry.gov.uk/csgndevelopmentfund. The CSGN stretches from Ayrshire, Inverclyde and Dunbartonshire in the west through to Fife and East Lothian in the east. Forestry Commission Scotland and Scottish Natural Heritage are lead partners for the CSGN. Local SNP MSP Stewart Stevenson has welcomed confirmation from Justice Secretary Kenny Macaskill that the by-law prohibiting the consumption of alcohol in public places in Peterhead will take effect from 20 February. Mr Stevenson has been a long-time campaigner for Aberdeenshire Council to introduce a by-law banning street drinking. The MSP, who has been on several late-night patrols with Grampian Police on a Saturday night/Sunday morning shift, says that the introduction of the ban should lead to less anti-social behaviour. “This has been a long-time coming and my mailbag and feedback from constituents indicates that this new by-law will be very welcome. “While we’re fortunate in Peterhead in that we don’t have an extensive problem with street drinking, there are problems which need action to address them. “The important thing is that we give the local police the tools to do the job so that if people are creating a nuisance in a public place as a result of alcohol, they can be dealt with. Banffshire & Buchan Coast MSP Stewart Stevenson has described the fact that fishing communities in the North East will benefit from a £2,155,382 fund to improve the quality of life and boost economic diversification as “hugely significant” for Banffshire & Buchan Coast. The funding through Axis 4 of the European Fisheries Fund (EFF) is expected to open to funding applications in early spring this year. Eligible councils have previously been asked to establish Fisheries Local Access Groups (FLAGs) which will consider applications and decide how the funding will be allocated locally. If the full allocation of EFF money is co-funded by local authorities, there will be a total of £7.6 million available to fishing communities across Scotland. Axis 4 of the EFF supports the sustainable development of fisheries areas. It includes measures to promote economic diversification in areas such as tourism and leisure, food and renewable energy that exploits local resources. It also aims to improve the quality of life in areas affected by the decline in fishing activities, such as small scale infrastructural projects, environmental protection and training and capacity building for local communities. “I am delighted that swift progress is being made towards allocating this funding and it is particularly welcome news that fishing communities in the Aberdeenshire council area will potentially be able to access such a significant sum; more than in any other eligible local authority. “Given the importance of the fishing industry to the area, this is a hugely significant development for Banffshire & Buchan Coast. The unprecedented surge in membership of the Scottish National Party following Tory leader David Cameron’s intervention in the debate on Scotland’s future has been replicated locally with new members signing up in Banffshire & Buchan Coast Constituency. Party chiefs confirmed at the weekend that 784 new members had joined the SNP across Scotland since the previous weekend, boosting party membership by 4% in just 5 days. Following the revelation that the Tory government plan to dictate the terms of the independence referendum from London, new members have been joining the SNP at a rate of one new member every nine minutes. Locally, SNP Branches in Peterhead, Fraserburgh, Banff & Macduff and Buckie have all reported a number of new members joining. Banffshire & Buchan Coast MSP Stewart Stevenson welcomed the huge support from the public that the SNP has received this week. “We have been overwhelmed with the support of the people of Scotland over the last few days. “The numbers of people going online to sign up to the SNP is simply phenomenal, one new member every nine minutes. “David Cameron should reflect on the fact that the SNP has 800 more activists just days after his blundering intervention into Scottish politics. “The SNP set a target of doubling party membership by the time of the referendum and we are well on our way and I’m delighted that Banffshire & Buchan Coast Constituency is leading the way on this. “From Selkirk to Shetland the SNP is Scotland’s party and we welcome anyone who wants to see the best for Scotland and who wants to play their part in taking Scotland forward." Legislation to complete a programme of property law reform in Scotland was published today. The Long Leases (Scotland) Bill will bring an end to ultra-long leases (let for more than 175 years and with more than 100 years to run) by converting them to ownership. 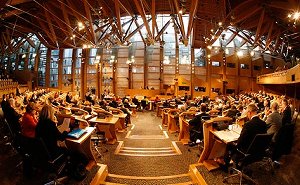 The Bill forms part of a programme of property law reform put forward by the Scottish Law Commission. This included the reform of feudal tenure through the Abolition of Feudal Tenure etc (Scotland) Act 2000. "This Bill will simplify Scotland's land tenure system. Ultra-long leases are so long that the tenant is, in effect, the owner in all but name. This legislation will simplify property law and convert virtual ownership into actual ownership. "Because these leases are so rare, lenders and solicitors may be unfamiliar with them. This legislation will, therefore, resolve any confusion for mortgage purposes. "Landlords will also be able to claim compensation but this will reflect the low rates of rent paid, with average compensation expected to be in the region of £200. "Implementing the Scottish Law Commission report will help to further modernise Scotland's property law and bring it into the 21st century." The Scottish Government estimates that there are around 9,000 ultra-long leases in Scotland. Two thirds of ultra-long leases have annual rents of £5 or less. Banffshire & Buchan Coast MSP Stewart Stevenson has expressed his backing for reduced inequalities and improved prostate cancer services in Scotland by signing The Pledge for Prostate Cancer. Anyone concerned about prostate cancer can call The Prostate Cancer Charity's free and confidential Helpline on 0800 074 8383. The Helpline is staffed by specialist nurses and is open from 10am to 4pm Monday to Friday and Wednesdays from 7pm - 9pm. Alternatively please visit www.prostate-cancer.org.uk. The starting gun for the first ever crofting elections was fired today (January 5) with the official publication of the Notice of Elections. For the first time, six people will be democratically elected by Scotland's crofting community to represent their interests. The remaining three spaces are to be filled by Ministerial appointment, today announced as Susan Walker, William Swann and Sandy Cross. The postal ballot for the further six members will take place in March 2012 with the count on March 16. The official change from the current Crofters Commission to the Crofting Commission will then come into effect on April 1, 2012. "I am delighted to announce the appointment of Susan, William and Sandy who will bring a great deal of knowledge, experience and drive to the Crofting Commission at this very important time for crofting. "Crofting is the very fabric of many of our rural communities, and has inspired songs, literature and art for hundreds of years. The Scottish Government wants to give crofters a voice to determine their own future and these first ever Crofting Commission elections are a solid step down that road. "Crofting has defined cultural shifts in our history. Today marks another historic moment - when Scotland's crofters get a seat at the table to make decisions that affect their future. "The Scottish Government believes crofts that are occupied and worked can be the biggest contribution to the sustainable economic growth and development of our crofting communities. Having an effective regulator is a vital part of achieving that aim." "The crofting elections are an exciting development for crofting as crofters will be able to directly influence how crofting is regulated in the future. I would encourage all crofters who are eligible to vote to make sure the commission have the correct details for them so that they receive a ballot paper. They should also consider standing for election and they should certainly encircle their vote." "This landmark election is a great opportunity for crofters to engage with the decisions that affect them. There are many able people within crofting communities from Shetland to Argyll and I hope to see many coming forward and running for the six positions on the board." The deadline for submitting changes to the Register of Crofts, which will be used to compile the crofting electoral role, is January 19 2012. Voting is restricted to one vote per croft and to one vote per crofter: a multiple occupancy croft must nominate one voter, and a crofter with multiple crofts is only eligible for one vote. Notice of the crofting elections was given by the Returning Officer for the election, Mr Alistair Dodds, Chief Executive of The Highland Council. The elections will be conducted using a postal ballot with ballot papers being issued on February 27 and the count taking place in Inverness at The Highland Council Headquarters on Friday March 16. The deadline for returning candidate nomination papers and application papers for proxy and absent votes is Thursday January 26. Minister for Environment and Climate Change today announced the appointment of three new members to the Crofting Commission. Susan Walker - has been an active crofter for three decades, producing much of the family food on a two acre croft in Camuscross, Isle of Skye. She is the co-author of 'The State of Crofting in Camuscross', an academic report on crofting in her local township of Camuscross, and writes articles for the press on crofting matters. She is a Director of Camuscross and Duisdale Initiative, an ambitious community trust that is working in partnership with crofters and grazings shareholders on local food and community infrastructure projects. Ms Walker holds no other current Ministerial public appointments. Sandy Cross - is a qualified investment manager with a career background in financial services, including several posts at managerial level in private sector companies, and is author of numerous articles on finance. He is closely involved in the rural economy and currently divides his time between Edinburgh and Shetland, where he is involved in farming, shellfish farming and is the landlord of a 1,600 hectare crofting estate. He will bring governance experience to the board of the Crofting Commission and will represent the interests of landlords of crofts. Mr Cross holds no other current Ministerial public appointments. All three of these appointments will be for five years and will run from April 1 2012 to March 31 2017. Each appointment is part-time and attracts a remuneration of £7,440 for a time commitment of four days per month.The Crofting Commission will take over the functions of regulating, reorganising and promoting crofting from the Crofters Commission on 1 April 2012, in line with amendments made to the Crofters (Scotland) Act 1993 by the Crofting Reform (Scotland) Act 2010. The Crofting Commission will contain a mixture of appointed and directly elected members, making it more transparent, democratic and accountable. There is also a statutory requirement for at least one of the members to be able to speak the Gaelic language and for at least one to appear to Ministers to represent the interests of landlords of crofts. These Ministerial public appointments were made in accordance with the code of practice published by the Public Appointments Commissioner for Scotland. All appointments are made on merit and political activity plays no part in the selection process. However, in accordance with the original Nolan recommendations, there is a requirement for appointees' political activity within the last five years (if there is any to be declared) to be made public. Mr Cross has declared activity with the Scottish Conservative Party. Ms Walker and Mr Swann have not declared any political activity. Following a short trip to the North Sea fishing grounds, trawler skipper Sandy West successfully completed the first landing of 2012 of langoustines (prawns), enabling Buckie processing firm Moray Seafoods to get the New Year off to a flying start by ensuring its customers are kept supplied with the highest quality shellfish. Skipper West and his four-man crew of the Fraserburgh-registered trawler Virtuous set off for the Fladen fishing grounds in the early hours of 1 January and after finding several good fishing marks was able to land its catch of excellent quality langoustines on 4 January into Moray Seafoods. 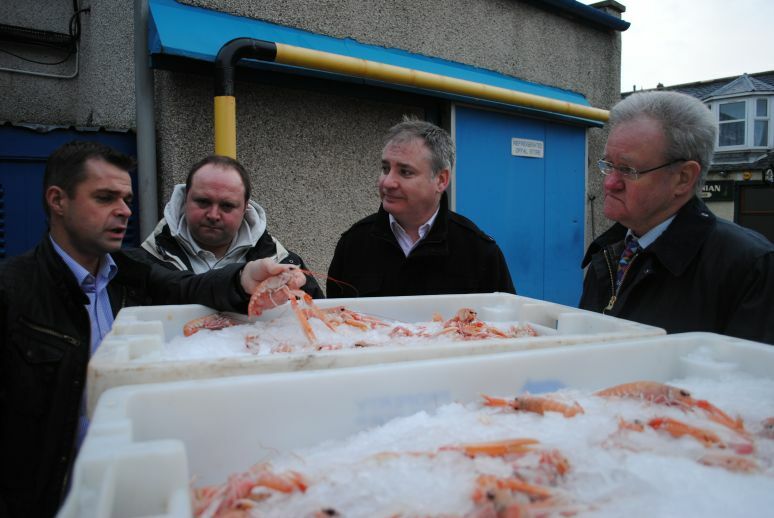 Waiting to welcome the delivery at Buckie was Fisheries Secretary Richard Lochhead and local MSP and Environment Minister Stewart Stevenson along with Moray Seafoods’ managing director Victor West. "Scotland's fishermen do an amazing job, often in very difficult and dangerous circumstances, to ensure we can enjoy the finest and freshest seafood. “Moray Seafoods is an important local employer and a vital part of the wider Banffshire economy so I’m delighted to be here today to give my backing to their support for quality, locally-landed langoustines. The latest reforms to modernise the management of wildlife in Scotland come into force today. The second commencement order of the Wildlife and Natural Environment (Scotland) Act 2011 introduces a new offence of vicarious liability in relation to the persecution of wild birds. This offence allows for the prosecution of those minority of landowners or managers who fail to take the appropriate steps to ensure their employees and contractors act within the law. The legislation also includes measures for a new hare close season, changes to the deer act and snaring law. "The introduction of vicarious liability highlights the importance of landowners and managers who run shooting businesses taking a proactive role in ensuring that their employees and contractors are aware of the law and their responsibilities for wild birds on the ground they manage. "Guidance being developed by Scottish Land and Estates, which I was pleased to contribute to, will help their members take the right approach. Most such businesses already do act responsibly, but the small minority of managers and owners who don't will be at risk of prosecution if their employees are found to have broken the law in this area. It is very important we get this right, alongside the other elements of the Wildlife and Natural Environment Act, in order to safeguard some of our most spectacular wildlife." "Scottish Land and Estates understands the motivation behind the Scottish Government's vicarious liability measures and is fully committed to stamping out wildlife crime. From the outset we have made clear our reservations about the necessity for a statutory approach but it is now important that there is absolute clarity for landowners, managers and gamekeepers on how the legislation will be enforced. "We are already very active within the Partnership for Action against Wildlife Crime in Scotland and have founded the Wildlife Estates Scotland scheme. Through joint working mechanisms such as these we hope to now ensure that it is only those who are actually culpable who are affected by this legislation rather than the vast majority who could potentially incur additional cost burdens." "This landmark legislation highlights the significance of the role of the landowner/manager in ensuring their employees manage their land to the highest of standards. Vicarious liability will serve as a deterrent to those owners and managers who turn a blind eye to questionable practices on their land, whilst also providing law enforcement with much needed powers to target the minority of land owners and managers who are content to benefit from offences committed by their employee rather than acting as custodians of our natural environment." The Wildlife and Natural Environment (Scotland) Act 2011 was passed by the Scottish Parliament in March 2011. The second commencement order comes into force on January 1, 2011 bringing into effect vicarious liability, new close season for hares and changes to the Deer Act and snaring law. The first commencement order came into force on June 29, 2011 bringing into effect game law reforms and species law licensing orders. Scottish Natural Heritage are responsible for implementation of many of the elements of the WANE Act including species law licensing and the Deer Management Code. New criminal law provision makes shooting business land owners and managers responsible for certain crimes committed against wild birds on their land by their employees, contractors and agents. However there will be no conviction under vicarious liability unless it can be shown that a crime was committed and that it was the owner's or manager's employee, contractor or agent who was responsible. Defence to vicarious liability for a land owner/manager to show he/she did not know about the crime and took all reasonable steps and due diligence to prevent it. WANE Act introduces a new close season for brown hares and mountain hares. The close seasons are February 1 to September 30 for brown hares and March 1 to July 31 for mountain hares. It will be an offence to intentionally or recklessly kill, take or injure a hare during the close season. The first close seasons for hares will start on February 1 2012 for brown hares and March 1 2012 for mountain hares. The close season is intended to provide protection for hares during the period when the are most likely to have dependent young. The majority of the deer provisions come into force on January 1 2012, including measures in relation to deer management and provision of a Code of Practice on Deer Management. There are provisions on competence in deer stalking linked to a review by SNH planned for 2014. The exemption to allow the despatch of deer due to suffering is also clarified. The majority of the snaring provisions, which includes the setting of snares, duty to inspect, record keeping, and the compulsory training course which operators must successfully complete, will come into force on January 1 2012. The requirement that all snares must be fitted with an ID tag and number is not expected to come into force until early 2013 to allow snaring operators sufficient time to successfully complete the compulsory training course which is a prerequisite for getting an ID number from the police.